Summer has instantly arrived over the past couple of days in the northeast! The past two days have been a triple H kind of a day, hazy, hot and humid. Which makes the article in yesterday’s Wall Street Journal so perfect, Sarabeth Levine described her ideal summer salads. I love salads and all the different dressings available to me on a gluten-free diet! But, what I love most of all is growing my own salad. The sunniest spot in my yard happens to be my deck and this is where I have all of my containers. I planted the lettuce and cherry tomatoes last weekend. These are both low risk, high yielding options for a brown thumb gardener like me. I even bought a couple of strawberry plants for fun because they grow like absolute weeds and figure I would have a really difficult time killing them. Last year I bought a bunch of herbs and just kept them in their little starter pots. I did not know that most herbs were perennials until a summer dinner party when the hostess showed me her herb garden and said she had planted it six years ago. 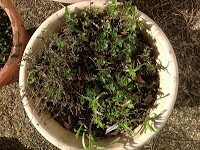 She advised me to throw the herbs into a real pot with some good soil and then see what happened in the spring. 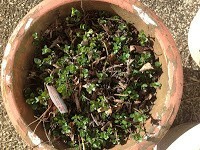 At the end of March, when we started doing some spring cleaning, I grabbed the pots that I had put on the side of the house and lifted the collection of dead leaves that had gathered on top to throw into the green waste bags. I was so surprised to see all of these little green leaves pushing up through the soil! Mint, tarragon, thyme, oregano and rosemary had all started growing anew! Two months later, the herbs are absolutely flourishing. As I wait for my lettuce and tomatoes to grow, the Wall Street Journal Summer Salad article had some great dressing ideas using these herbs. One was to make a blender dressing using fresh tarragon is you are adding salmon or chicken to the salad. For a basic oil and vinegar, throw some basil, parsley and oregano into the blender. I just planted the parsley and basil so I will have to wait a week or two for that dressing. For bitter greens, like arugula, lemon juice and a lighter oil such as canola oil, whisked together with a little salt and pepper is a nice combination. My biggest problem with salads is that only one of four of my kids would be happy to see a big chopped salad with some chicken or fish on top. For that solution, I will turn to other articles on advice for getting picky tweens and teens to eat vegetables.